Grande-Store’s deceptively spacious low profile resin sheds cater for multiple storehouse solutions, their mini-size paves the way for positioning in confined areas whilst Duotech innovation unites rustic appearances with decay-resistant polypropylene to combat weather aggression. Grande-Store’s reduced height escapes dominating the landscape when situated in restricted garden locations. Sat beneath the standard fence-height & most home windows are favourable spots as they refrain from obscuring outlooks meanwhile they’re a snip to construct upon comparison to spacious walk-in facilities. Locating a few 6 x 3 ft horizontal stores instead of building large walk-in facilities is becoming a popular course of action, sidestepping planning regulations, foundation preparations and time-consuming constructions, a favourable alternative to most of our inexperienced DIY skills. The Grande-Store’s basic few-hours assembly certainly sparks interest meanwhile their only necessity relates to positioning on solid level ground. Duotech’s cutting-edge manufacture surpasses conventional resins by incorporating imperishable additives within the recyclable polypropylene in order to combat decay & assure continued weather endurance further to creating an ultra-stylish fascia courtesy of innovative molding techniques, the blueprint of their design. The twin-lined fascia constitutes two sheets of Duotech material united together by an internal structure in order to withstand dents meanwhile their ‘tongue & groove’ edging rapidly constructs, satisfying assemblers. During construction the fascia panels are buttressed by steel supports to ascertain rigidity. Silvery pigments along with embossed molding creations depicting wood-grain features display appealing rustic charm to the look & feel meanwhile UV inhibitors prevent blanching in the sun further to armouring the make-up to overcome sunburn fractures. Whatever the weather enforces upon a Duotech composition the backbone of decay-resistant polypropylene is there to protect, regardless of situated in long-term damp environments, persistent showers or sweltering heat. Upkeep of appearances is quickly restored virtue of a wash & scrub. White vinegar or household detergent aids the process of dislodging ingrained muck & grime. Most operate the occasional pressure-wash whereas we prefer to use the hosepipe jet-shower due its water-connected convenience sat on the patio. Wish to Stamp your Statement? Duotech’s composite presently occupies an unrivalled position in the resin shed industry with regards to providing a paintable fascia, virtue of incorporating resin talc that adheres to paint. Don’t be mistaken thinking a binding of oil-based paint is necessary, far from it, acrylic emulsion commonly termed kitchen & bathroom paint is recommended. Acrylic provides a toughened finish due to comprising a hardener that caters for wiping down without leaving blemishes. Water-based emulsion brushes on effortlessly, decorates efficiently using paint-rollers, cleans-up with water and dries super quick especially outdoors aided by the breeze meanwhile it’s available in all the rainbow colours with choices of glossy radiant finishes to more subtle matt tones. Tasteful colour schemes to accentuate the backdrop of surroundings can be uniquely created to brighten up any garden setting. Duotech page demonstrates what can be created when you wear your imaginative hat, as presented on their High-Store. Problem is: Could you fashion to cover up Duotech’s smart silvery appearance? meanwhile painting will inevitably lose its bloom stood outdoors & require future re-coats. Once the broad twin doors spanning the shed’s width and expansive lid open, leisurely accessibility to the Grande-Stores entire storage collection couldn’t get more convenient. An integral floor encloses the internals by means of interlocking the wall panels within the perimeter groove to impede windy draughts of debris, pests and rainwater from finding entry. The floor constitutes a toughened mix of polypropylene which is molded into a heavyset base to sustain the stresses of lawnmower movements meanwhile aiding the rolling in procedure lies a sloping threshold down at the entrance. Notably, the floor’s long-term endurance necessitates being laid upon a solid flat surface to withstand burdensome tensions; underlying crevices & fissures will eventually reduce the lifespan. 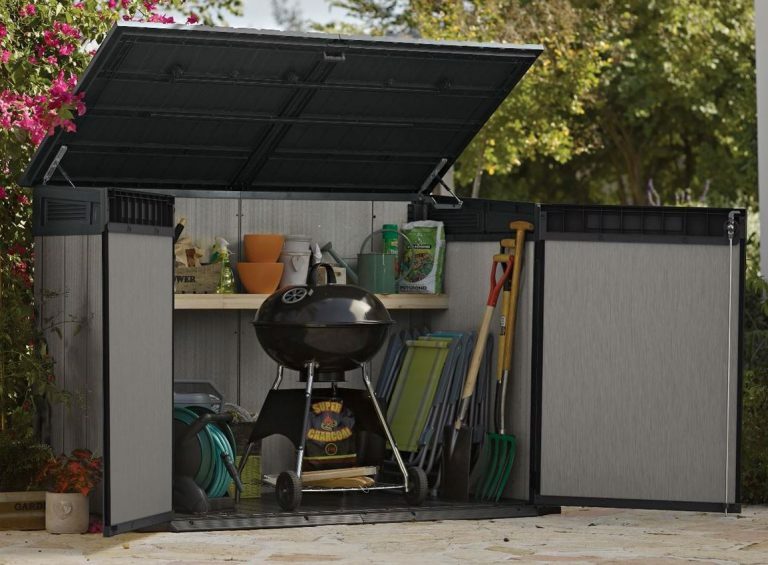 After measuring the internal dimensions I think the Grand-Store offers ample storage space, providing handiness for storing patio and barbecue gear. Internal measurements will accommodate all our patio chairs & parasol including the large table which folds & stands vertical – convenience in a nutshell. Moreover, the store includes adjustable shelf supports along with instructional measurements for fitting a wooden shelf, a useful addition for BBQ essentials. 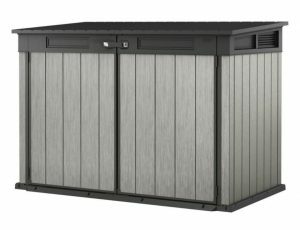 Storing furniture cushions & swimming towels in a preserved environment is aided by facing ventilation grids distributing freshness, the integrated floor panel maintains a clean environment whilst the impermeable resin manufacture and shallow drainage gradient of the overlapping lid delivers a weatherproof enclosure. 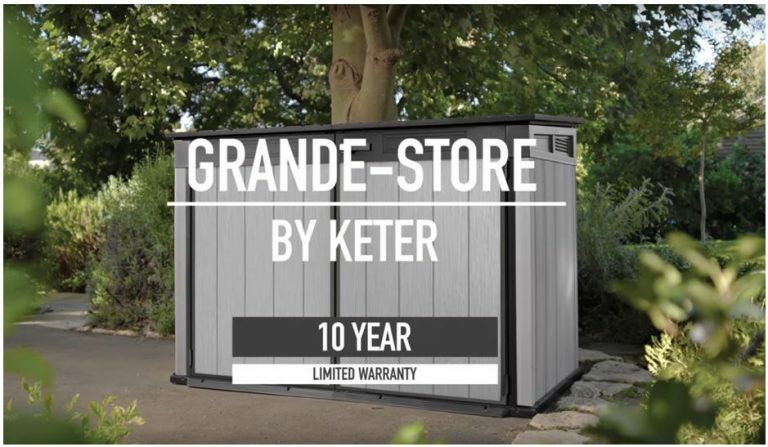 Keter advertise the Grande-Store is able to securely shelter two adult bikes together with two children’s bicycles however this does depend on their size. I recommend measuring your bike collection with the internal dimensions to ascertain they adequately fit in, prior to purchase. Measurements are presented above. 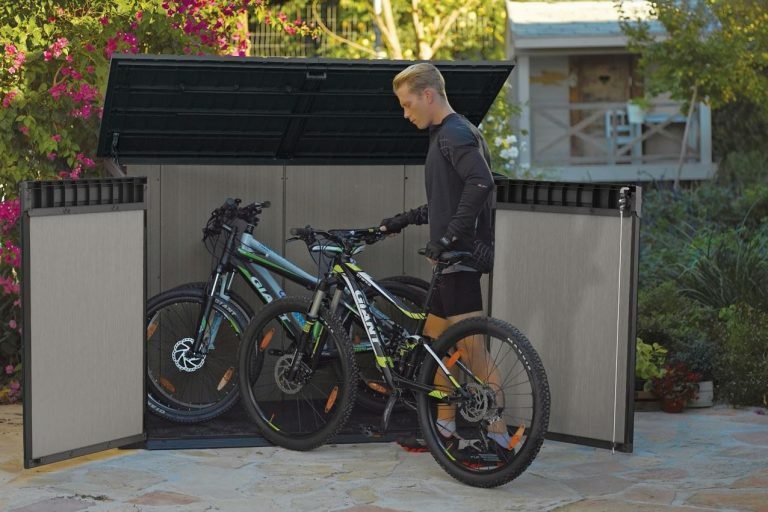 Storing bikes outside the home and garage frees up an enormous amount of space, bike handlebars awkwardly take up plenty of room restricting car door access in garages. We’ve found this to be a frustration in the past, leaving the car parked on the road until finding time to reorganise. The front doors and lid open widely ajar enabling to leisurely wheel-in & park meanwhile locking up regards a simultaneous 3-way security system virtue of a padlock clasp adjoining all 3 doors conjointly. Although most purchasers are satisfied with Grande-Store’s security features, one review did have concerns for expensive bikes. In my view, resin and wood sheds are not fully intruder proof due to comprising dangling padlocks that can be cut, drilled or picked by knowledgeable thieves who have the required tools. Asgard’s weighty steel bike lockers on the other hand ascertain unmatched security, best described as bike-vaults. Worth inspecting if security tops the agenda. The Grande-Store caters to facilitate as a recycling station, able to accommodate two 96Gal / 360L wheelie bins or three 63Gal / 240L trash cans on account of the spacious interior. You’re provided with a set of hygienic-friendly lid-to-lid chain mechanisms for attaching the wheelie bin lids to the Grande-Store lid in order to prevent touching the bins. All bin lids open simultaneously when the Grande-Store lid swings ajar. The lid is one hefty lump, spanning 6 x 3½ feet therefore Duotech have incorporated hydraulic pistons on both sides to aid lifting the weight. Start to open the lid & the gas pressure takes over, easing access meanwhile additionally soft closes the lid to prevent the weight from walloping down and crushing fingers, delivering a user-friendly design. 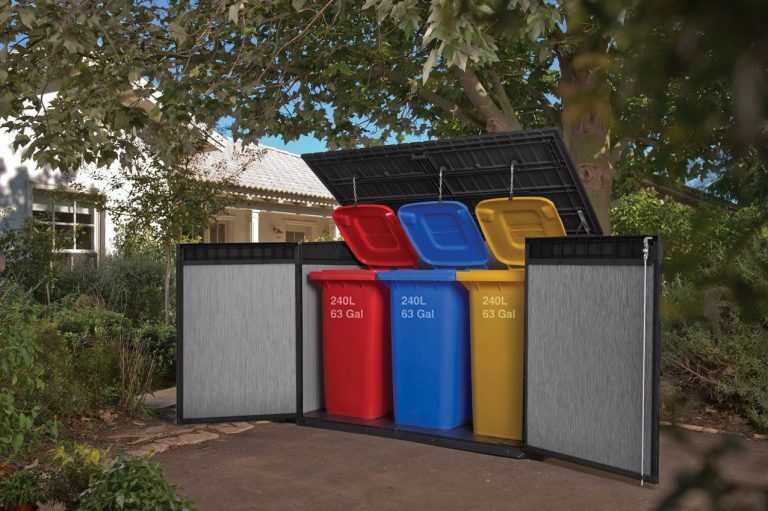 Overcoming waste disposal odours, built-in ventilation panels located either side generate a continuous throughput of outside freshness to disperse the interior and exit nasty smells. Adapting as a spacious kids toy-shelter on account of Duotech’s child-friendly design comes across favourably in feedback further to generating a rapid garden clear up in minutes flat on account of providing extensive access. Many people convert the Grand-Store into a dry log-store during winter’s period due to the resurgence of cost-efficient log fires. A dry environment is crucial for wood-log storage, Grande-Store delivers. Talking to a friend recently, he was undecided about building a wooden storehouse to accommodate all his fishing gear and prevent odours drifting through the home but like he mentions, topping a self-built wooden store off requires roofing felt which soon disintegrates through changeable weather-forces. A polypropylene lid suchlike Duotech’s manufacture replaces weather-related dilemmas, his mind’s set on the Grande-Store. Constructing the Grande-Store is moderately straightforward. Once the base is aligned & joined together, vertical struts slot within the corners simultaneous to securing to the fascia sheets, followed by installing the doors, lid and hardware. There’s one huge pile of screws therefore a drill driver with the motor torque set to low becomes an assembler’s best pal, quickening the procedure. A level platform is necessary to assure the correct workings of the doors are derived from a perpendicular construction whereas stationing on flat solid ground enables the floor to withstand storage tensions as well as attaining a firm fix if anchoring down is your objective. Anchoring the Grande-Store is described as an option. Many people sidestep this measure due to the low height being sheltered from weather gales however 4 placements are presented in the floor for driving down grounding bolts. Duotech have unequivocally overshadowed competing resin constructions, evading the impression of plastic by creatively simulating the style of weathered wood meanwhile optionally cater for customisation with regards to incorporating a shelf & decorating the store uniquely yours. Assuring weather-resistance and sturdiness, the Grande-Store’s a cinch to maintain meanwhile 10 years of warranty satisfies peace of mind. Hope Duotech’s Grande-Store provides plenty of inspiration with regards to low-height outdoor storage accommodation. Please share your horizontal resin shed favourites and queries below, pleasure to help. Please share Duotech’s Grande-Store. Thank you. Great review on Low Profile Resin Sheds – Grande Store, Simon! You have highlighted how versatile the low height shed really is, and identified options I hadn’t even considered for such a shed, the BBQ and bike storage in particular are quiet inciting! The composition of the resin mixes, as you detail also seem strong enough to withhold the various weather conditions I face, extreme heat in particular. 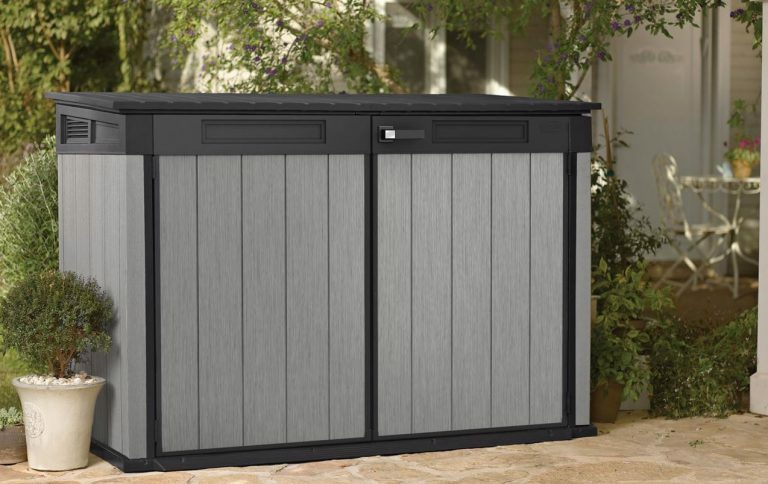 I will pass on this article to my father in law actually as he was looking for outdoor storage options in a limited space. Thanks for a fantastic review. Hi Nicole, thanks for calling in to explore Duotech’s Grande-Store. This type of low profile unit is extremely versatile, fits in restricted locations and is very straightforward to construct. Popular services include storing gardening tools, lawn & plant feed – a place to park bikes – swimming gear & pool supplies – BBQ fuel & grilling tools – patio essentials, furniture, throws & seating cushions – a refuse recycling station – a dry wood log store – sporty stuff & equipment – outside toy storage – the list goes on. 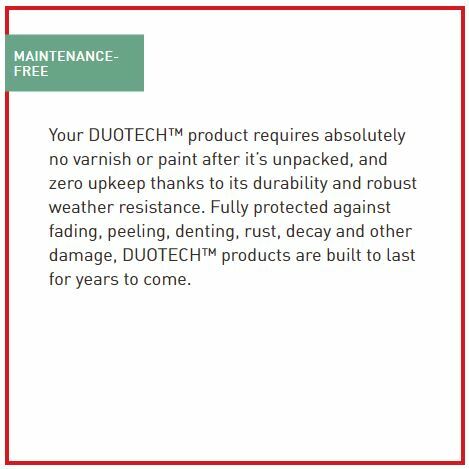 Duotech’s UV armoured polypropylene regards a resin that’s unsusceptible to rot, decomposition & corrosion meanwhile delivers protection against the affliction of sun-rays therefore the manufacture remains in an unaltered state throughout the year’s 4 seasons. 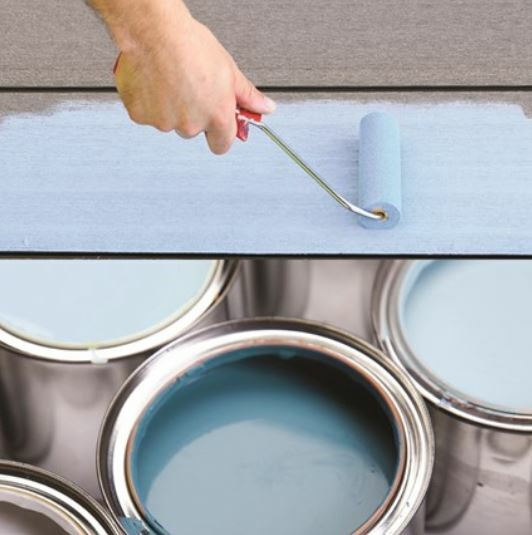 Furthermore, it’s customizable if you wish to decorate your statement, however, paint will eventually colour fade and require the occasional re-coat. Hey Mercy, The Grand-Store mimics the rustic style of weathered wood to high effect, it’s designed to complement any outdoor space whether positioned on a patio or backyard whilst serving to store a diverse assortment of gear including a waste recycling station as you suggest. The internals are quite spacious, it will accommodate 2 jumbo sized 96 GAL bins or 3 smaller 63 GAL wheelie trash bins. 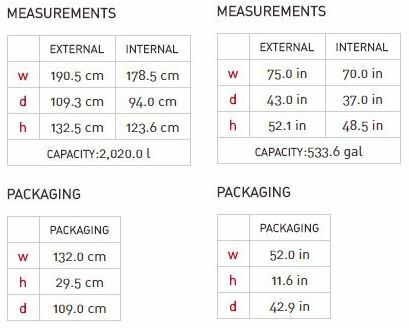 The internal dimensions are presented above to enable grouping your bins together and measuring to ensure they fit in meanwhile the external measurements ascertain the store fits your intended location. 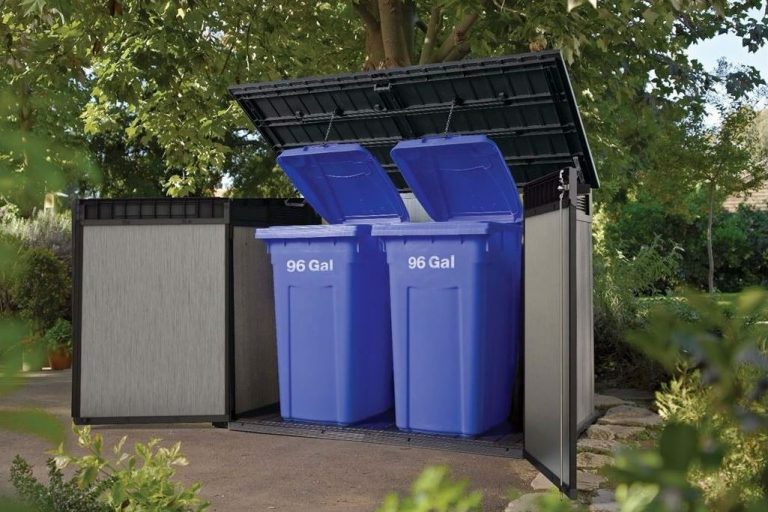 You’re provided with a series of chains that link the grande-store roof with the trash bin lids which operates a more hygienic method of emptying household waste without touching the bins, this feature gets the thumbs-up from many people. Yeah, don’t wheelie bins look messy when they’re scattered all over the place especially like you mention when they get knocked over by the car. A unit like this hides their unsightly appearance whilst looking super stylish. What a comprehensive and detailed article about the sheds. I certainly enjoyed and learned lot from your article. This shed looks like a great quality product that would last for years. I can think so many thing I can put in the shed. Once I purchase my house, I will be sure to buy something from your link. Thank you for your work and for sharing. Hey Hong, the make-up concerning the Grande-Store constitutes polypropylene which is ever-enduring, I don’t think there’s any estimates out there when this type of material would start to decompose which certainly describes its long-term resistance to rot besides being UV stabilised, providing armoury against sunburn ruptures and bleaching. Good job it’s completely reusable, this product can be recycled again & again, therefore it’s environmentally green. 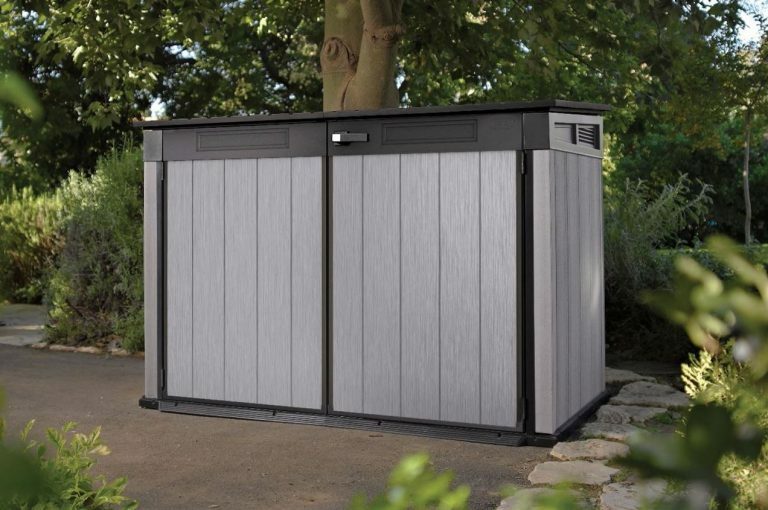 Reading through the article demonstrates how versatile these units are for storing a diverse range of stuff, from a recycling rubbish station, bicycle shelter to anything concerned with outside storage that’ll fit in. I know someone who switches use to a dry log store over the winter period, he says it’s a useful store all year round for their concerns in various ways. What seems to please so many of us relate to their ease of installation, you can have this low profile unit built, stocked-up & serving within a few hours of two people constructing meanwhile it’s able to locate in tight narrow spots without dominating the outlook due to the mini height plus the deceptively spacious interior accommodates a wide selection of gear. Wow, what a great reviews on really useful sheds. These sheds look amazing and I am sure they are really helpful in tiding up and organizing the space. I will recommend this site to my friends who are looking for one. You Always share great reviews and ideas about sheds and organizing space, I am really impressed with your reads. 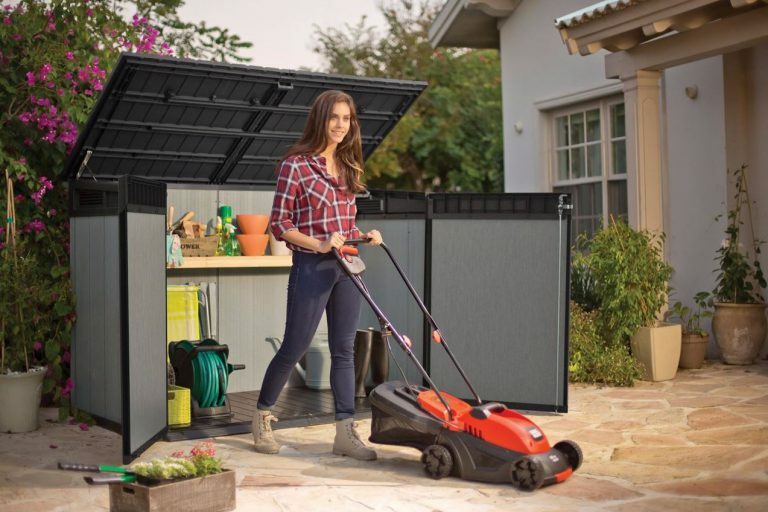 Hey Sarah, the reason for Grande-Store’s popularity pertains to their versatility, they have so many uses for outside storage from sheltering gardening tools to patio & barbecue essentials or for use as a bike park to hiding unsightly wheelie trash bins from view. I like the hands-free chain idea that lifts all the bin lids simultaneously when opening the Grande-Store so you don’t have to touch the bins when emptying household rubbish – a well liked user-friendly hygienic feature. Meanwhile, their mini height stations below the conventional height of a house window & the standard garden fence-line further to fitting in restricted placements to which many situate on their patio due to exhibiting a very stylish rustic presence whereas others brighten-up their seating area by decorating personal colour schemes onto the fascia panels. The Grand-Store comes across having a very straightforward installation method too which is imperative for most of our inexperienced DIY skills. Okay there’s quite a lot of screws but doesn’t appear over-daunting, the entire unit constructs together leisurely within a few hours, satisfying assemblers. I have a wooden shed in my backyard that will need replacing very soon. The roof is sagging, and just started to leak a bit. So reading about these sheds and storage units was great. I hadn’t really been planning to replace the old shed, because I thought the cost would be prohibitive. But these seem very affordable. I love that they don’t require any maintenance once assembled. The low profile is also nice. My present shed is kind of intrusive–higher than I need, and now that it’s older it has become a bit of an eyesore. I can easily imagine a new, lower storage unit looking much nicer! Thanks for the review! I think you made up my mind for me. 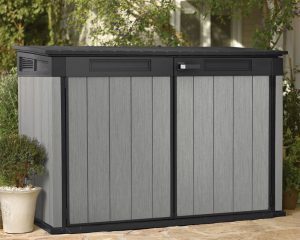 Hey Jane, thanks for dropping by to read about Duotech’s low profile garden shed. A sagging leaking roof is what finished our traditional wooden hut days off, the roofing felt that conventionally covers them disintegrates too quick and catches you out unaware until one day you walk inside, presented with a flooded floor that in-turn starts to rot. Same thing happened to my cousin just before winter set in. Owing to time constraints nothing was sorted till spring but unfortunately he lost his entire storage. I helped him chuck the lot in a skip and dismantle the shed. That was an expensive weekend having to replace all the gardening equipment, therefore I understand your concerns. 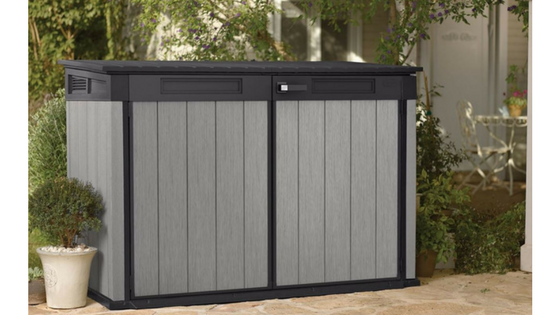 What sets these horizontal sheds apart along with their weather-resistant make-up is they’re very straightforward to assemble. Constructing can be accomplished in a few hours including stocked up and serving requirements. They also sidestep planning stipulations within certain local authorities. I know a few people who have opted for a few of these designs positioned in different areas of their garden organising storage in more compact way in order to escape planning regulations. More prevalent in the USA than the UK I might add. Yeah, they do stand unobtrusively without dominating the landscape, slip into confined areas and below the conventional house-window or garden fence height plus they stylishly enhance a patio serving to shelter chairs, cushions and BBQ essentials etc. Duotech also manufacture a High-Store made from identical composite catering to mix, match and customise with a splash of paint if one desires to make a patio statement meanwhile they manufacture a range of walk-in sheds named Oakland that span from 7 feet square up to 11 ft in length fulfilling services for all circumstances. Best bit, they’re a doddle to clean whilst immune from decay. I have been looking for something of this quality to store my garden tools in. Most of the containers I have seen have been flimsy and not storm or water proof. These appear really strong and sound. I love the fact I can paint them without special preparation. They can be matched in with their surroundings and camouflaged to fade into the background. what a great idea. The need for a level base is not a problem as far as I can see. It would apply to almost any garden container of this type. A cracking piece of kit. Hey HappyB, thanks for commenting on Grande Store’s low profile resin sheds. 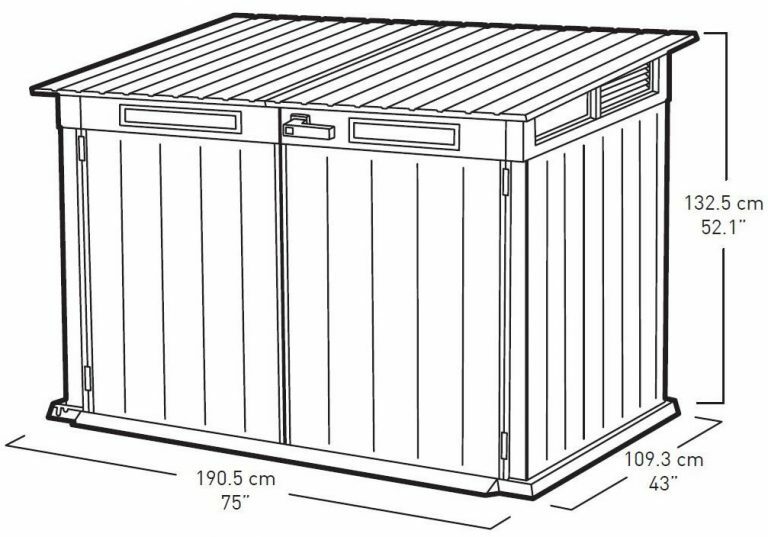 This type of container delivers convenience for storing all sorts of stuff outdoors, it’s horizontal design caters for fitting in restricted garden placements and patios yet the internal dimensions generously provide adequate room to accommodate a varied range of gear as mentioned. The new horizontal shed designs rolling onto the market presently have enhanced sturdiness in comparison to the older models due to steel reinforcements bracing their resin fascia panels. Accomplish stability and the imperishable make-up takes care of itself including keeping the internals dry & ventilated. Duotech’s paintable surface is unique for an outdoor resin storehouse composition, courtesy of applying a resin talc formula into the polypropylene thereby catering to decorate personal colour schemes that brighten-up home surroundings in resplendent finishes. Like you say, apart from a wash & dry, there’s no preparation work involved when applying further coats, plus acrylic emulsion’s so much easier that oil-based undercoat & gloss to decorate. A perpendicular stance accomplishes correct door workings meanwhile catering to provide heavy duty services requires solidity laid below therefore like you mention, a solid level platform is essential. Glad you enjoyed the review, keep calling in. A very interesting post you have made here Simon. I can imagine so many applications for these sheds. A Grande-Store would be perfect for storing my chopped wood when the fall and winter rains hits (I’m from Sweden by the way). How will they stand a couple of northern four seasonal years? Hi John, thanks for your interest and reading all about Keter’s Grande-Store. 6 x 3 feet including a 4 ft height are quite spacious dimensions for a mini storehouse therefore usages are quite diverse. I’ve mentioned 7 of the most popular services people tend to use the Grande-Store for, positioned in their garden however as you can probably imagine there’s plenty of additional services. Having a dry space for storing logs is becoming quite a needed item in the UK nowadays alike you in Sweden owing to the resurgence of log fires. This Grande-Store is ideally suited for this purpose. I have seen the inexpensive sheds years ago, made out of plastic, they did not seem to stay together well. The composite material sounds like it would last longer, the size and design looks to fit into any environment. I like how they can sit next to an existing shed, in a covered area around a house, or not cause trouble with zoning. Hi, thanks for calling in to read about Grande-Store’s Duotech manufacture. I know the original horizontal stores suchlike the Store-It-Out midi you describe, they are very basic and inexpensive but did and still do provide a service for outdoor storage. We know a few of our friends who prefer to purchase the cheaper alternative and exchange models every few years, coinciding with their two years warranty I suppose. They are incredibly cheap when compared to this Grande-Store, so I do see their point but have to agree with you with regards to their issues regarding basic plastic manufactures and fixings. Plastic hinges are their main concern, especially when the wind blows their doors ajar, they snap too easily. PVC windows evolved the same way when they were first designed. Their issue related to cheap handles and hinges wearing out too fast but look where we are today, most of us wouldn’t wish for wood-framed windows and all the upkeep hassles they entail. Duotech’s composition has all the resin mixes incorporated to withstand weather attack including UV protection, assuring long-lasting endurance against decay and depreciation no matter what environment it’s located in plus like you mention, their mini height presents an unobtrusive standing that’s ideal for restricted zones whilst benefiting small garden areas meanwhile assembly is so much quicker.